What is a Nevada Promissory Note? Nevada Promissory Note: What Is It? A Nevada promissory note is a written contract between a lender and a borrower related to a loan provided. It may be secured or unsecured. A secured promissory note involves the use of collateral. If the borrower doesn’t pay off the loan as promised, the lender has the right to collect collateral to satisfy some or all of the loan. A loan to purchase a vehicle is the most common form of secured promissory note. An unsecured promissory note is a signature loan. There is nothing that the lender may collect if the borrower does not pay as promised. The parties to the agreement are the lender and borrower. It may also include a co-signer. Nevada promissory notes are subject to contract law. In some instances, they’re also treated as securities under the law. In Nevada, there is no maximum interest rate. Lenders and borrowers may agree to any interest rate (and other fees) they’d like as long as it is in writing. If nothing related to interest in mentioned, the default interest rate is the contract or prime rate of Nevada’s largest bank plus 2%. The creation date for the promissory note. This date shows the date that the parties voluntarily entered into the agreement. The date if formatted as month, day, and year. 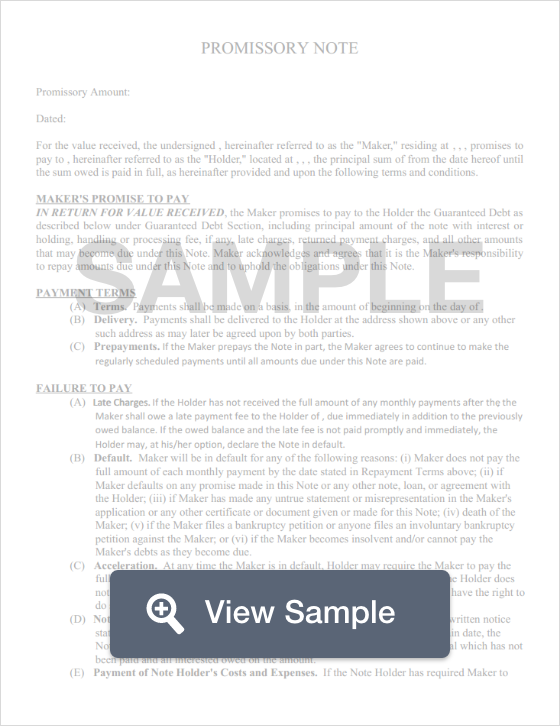 The date that the promissory note is signed is also important. The identity of each party to the agreement and the role they’re in. The parties should be identified by the legal name and their role within the agreement. For example, Jonathan Smith, Borrower. If there is a co-signer, their information and title should also be included. The mailing address for each party. In addition to including the mailing address for each party, a secured promissory note should also include the physical address for the borrower and any co-signer. This may be helpful if the lender must retrieve collateral. If the lender has a main mailing address and a separate address for payments, the payment address should be included in the repayment agreement portion of the promissory note. Principal balance. This is the amount of money that the lender provided to the borrower. This section does not include the interest rate. Before the promissory note is signed, this number should be reviewed for accuracy. The amount of interest charged by the lender. Remember that there is no maximum interest rate in Nevada. The promissory note may use any interest rate. If no interest rate is mentioned, the amount charged is the contract or prime rate of the State’s largest bank plus 2%. Payment agreement. The payment agreement explains how the borrower will repay the loan. It includes the number of payments that must be made (known as installments), when those payments must be made, the amount for each payment, and whether a late fee will be charged if the payment is late. If so, the amount of the late fee should be documented as well as how many days after the payment was due that the late fee will be charged. If the promissory note is secured, remember to include the proper information about the collateral. Without this information, the court may not treat the note as secured. Interest Due in the Event of Default. This is the amount of interest the borrower will be charged if they default on the loan. This is particularly important since there is no limit of interest that may be charged in Nevada. The agreement may start off with a lower interest rate and a default may cause a much higher interest rate to be charged. Payment Allocation. This is how the payments from the borrower are split between the principal balance and the interest. Prepayment. Whether the borrower will be assessed with a financial penalty if they pay the loan off earlier than the agreed upon contractual life of the loan. Acceleration. The lender has the right to demand immediate and full repayment of the balance due if the borrower does not comply with the terms of the agreement. Attorney Costs and Fees. How attorney costs and fees that may arise for the parties from a legal disagreement will be handled. Waiver of Presentments. The lender is not required to be physically present when the borrower makes payments. Severability. If one portion of the Nevada promissory note is found to be invalid, the remainder of the note stays in effect. Conflicting Terms. This clause outlines how any conflicting terms in the promissory note will be clarified. Notice. A notice clause explains whether the lender will notify the borrower if they plan to sue them because of not complying with the note. Governing Law. This clause documents the state whose laws will be used if a disagreement over the document comes up. There is no legal requirement to have a Nevada promissory note notarized. It must be dated and signed by the borrower and any co-signer who is a party to the agreement.